You've found the original Stand Steady Tranzendesk! It's the stand-alone stand up desk you have been looking for. It's so easy to assemble, in no time you'll be experiencing all the benefits that come with standing at work. Tranzend your sedentary office life today with your Tranzendesk! The perfect standing desk for dual screens! FULL SIZED WORKSTATION: This 55 inch-wide stand up desk promotes increased productivity by providing plenty of room to work. It also reduces all of the downsides of sitting down too much, like bad posture which leads to neck and back pain! ADJUSTABLE: The Tranzendesk sit stand desk easily transitions from sitting to standing. Go from 29 inches to 46 inches high with a simple turn of the crank! EXCELLENT QUALITY: The stylish black surface and silver coated legs are made of durable materials that ensure years of product life. EXPANSIVE FLAT SURFACE: You'll no longer need to worry about space for your workstation. This adjustable standing desk fits two monitors easily as well as your keyboard and any other items you need! 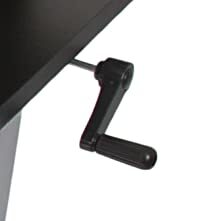 CRANK MOUNTS ON EITHER SIDE: Want to put this desk against a wall or cabinet? No problem! The easy-to-use crank can be mounted on either the right or left side. You’re ready for this desk – Tranzend your workplace Today! Spacious surface – a lot of room for multiple monitors! 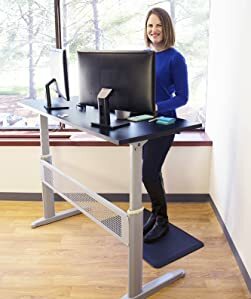 This height adjustable stand up desk easily adjusts from sitting to standing with a smooth crank - adjusting from 29" to 46" to accommodate a broad range of heights! Simply designed to make it easy for you to move throughout the day! 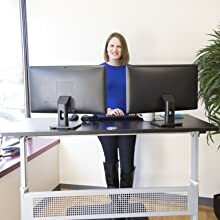 The Tranzendesk Standing Desk easy to use crank handle allows transitions between sitting and standing to be a breeze! Simply crank the handle to your perfect ergonomic height! Conveniently, the crank can be placed on either side of the desk! Who couldn't use extra desk space? With this extra wide stand up desk, you will have space for up to 3 monitors and plenty of desk space for notes, to-do lists, and so much more. So much space in a sleek modern style! This sit stand desk can hold it all with a weight limit of 85 lbs. With your Tranzendesk full-size stand alone standing desk, your entire desktop can move to whatever height you want! Alternating between sitting and standing throughout the day gives your body and mind the movement and ergonomic variety we all need for a happier and healthier workday! We STAND behind our products! We want to help you have a happier & healthier workday! If you are not 100% happy with your desk, our outstanding team is here to help you! 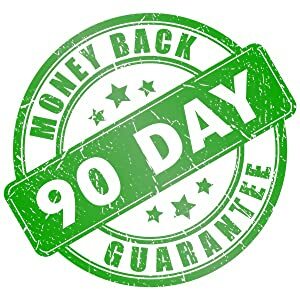 We will happily refund or replace your desk if it arrives in anything less than perfect condition! 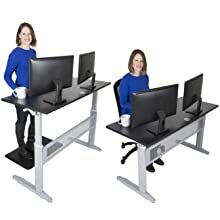 Click here to compare all Stand Steady Tranzendesks. I searched for a while for an adjustable standing desk but found them too expensive. Then I found this hand-crank model for about 75% less, and took a shot. It's exactly the size I want, well-built and strong, without being heavy. And it has no electronics that can break, which has caused $100's in repairs for other things like my oven, dishwasher, amplifier, etc. Making a mechanically adjustable desk was a stroke of genius! 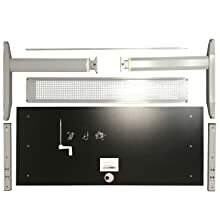 Easy to install, quick simple instructions, works great, good amount of surface area and easy to adjust the height. Great! I work at home 9-11 hours per day. I love the ability to crank the desk up and down so that I am not locked into a chair all day. I did add wheels to my desk which gave me the added benefit of being able to move around the house. I have an extension cord and rigged a power strip to the back of the desk. (I have three monitors that require power.) Now I can move around the house or onto the patio on a nice day, and either sit or stand to work. This desk has really changed my quality of life. Great desk! Good quality, easy to assemble. Being able to change from sitting to standing has helped my hip & knee pain.